About this time, compulsory manual labor was abandoned; however, voluntary manual labor continued. 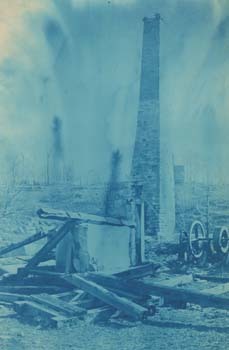 Pictured here is the manual labor shop after a fire. Students produced articles which were sold by the College. Part of the proceeds could be applied to the students' term bill. 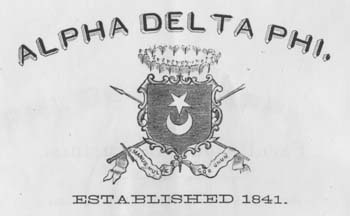 Alpha Delta Phi, the first fraternity at Western Reserve College, was established. Its founding members consisted of four seniors and two juniors. 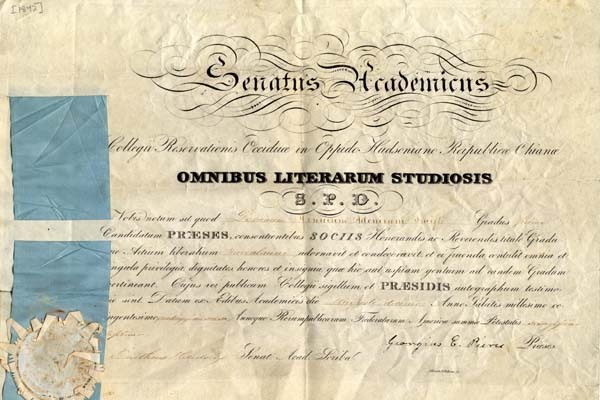 The early graduates received diplomas written in Latin. Since all students were required to study Latin, reading them was not a problem. The first classes were held by the Medical Department. Students had to contact each teacher to enroll in that teacher’s course, and pay a stated fee. 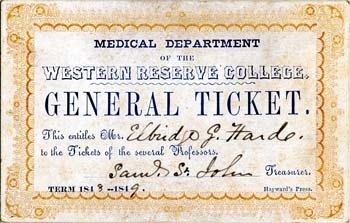 Pictured is an example of the "admission ticket" required to enter the lecture hall. 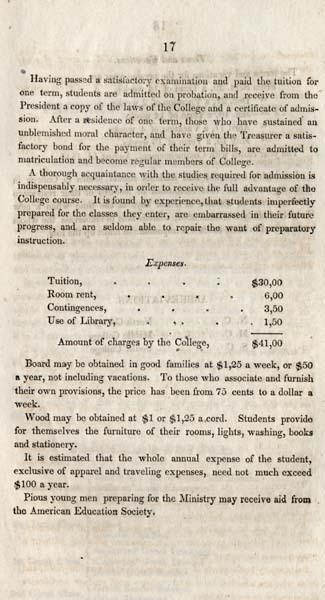 Expenses for the year at Western Reserve College included $30 for tuition and $1.50 for use of the library. Students were also expected to spend $1.00 per cord of wood and to provide (besides books) their own furniture and lights. 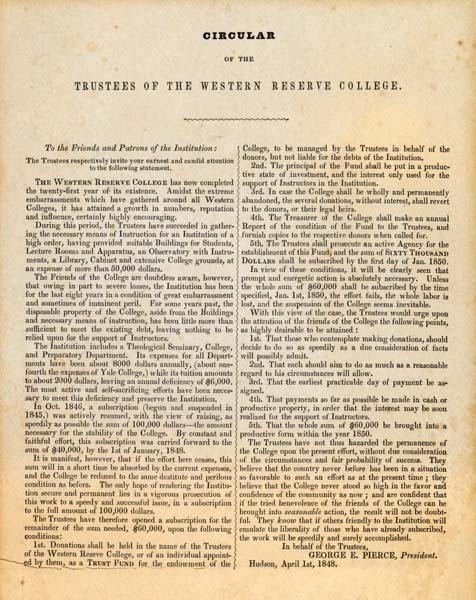 Concerning the admission of students: "No person shall be admitted to membership in the College until he has completed his fourteenth year; … Every person proposing to become a member of the College, shall present satisfactory testimonials of good moral character, and sustain before one or more of the Faculty an approved examination…." The annual Junior Exhibition featured student orations and music. 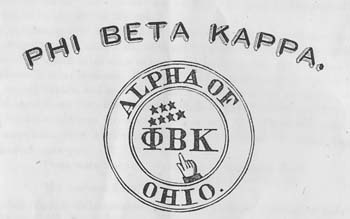 Phi Beta Kappa established the first Ohio Chapter (Alpha) at Western Reserve College. The "public phase" of a $100,000 fundraising campaign for endowment was launched. "Unless the whole sum of $60,000 [remaining] shall be subscribed by…Jan. 1st, 1850, the effort fails, the whole labor is lost, and the suspension of the College seems inevitable." 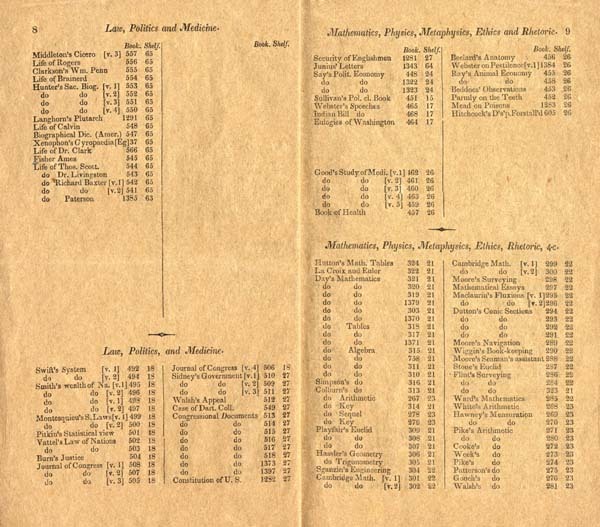 Before online catalogs and even before card catalogs, the holdings of the Western Reserve College library were recorded in printed pamphlets. 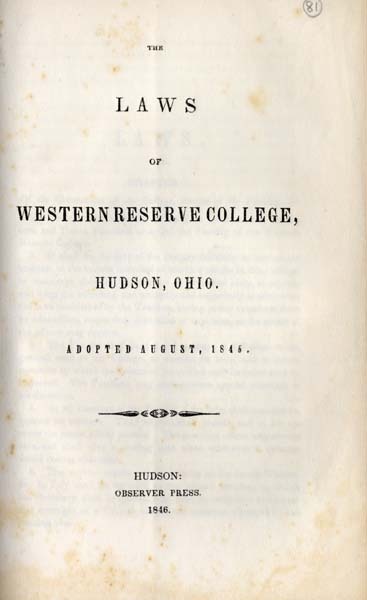 The 1849 Catalogue of Books Belonging to the Library of Western Reserve College is the earliest in the Archives. Regular return days for borrowed books were the 1st, 5th, 9th, and last Saturdays each term. The regulations also state that "No books are to be taken out of town." 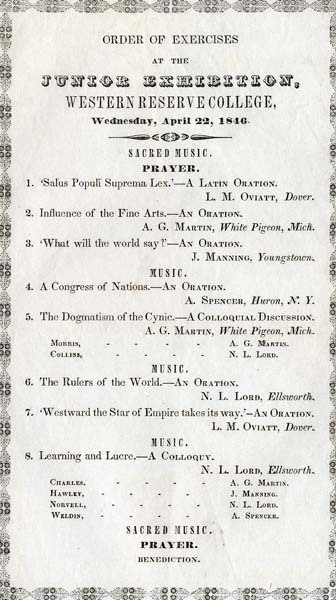 Information was compiled by staff of the Case Western Reserve Archives, February 2006.